Evelyn Gaiser presented "Lakes Write Music. Science listens." at the fifth TEDxFIU (November 16, 2016). Evelyn translated high-frequency lake data to music in order to better understand changes. 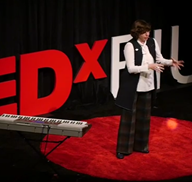 "Lake Annie's Song" was created with data by Evelyn, arranged by Marcus Norris, and performed by Yaniv M. Cohen, Aryam Gonzalez, and Thomas Lopez (FIU School of Music) at TEDxFIU.